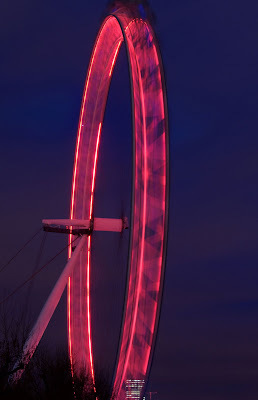 A glimpse of the London Eye at night. Congratulations on being selected for Blog Of Note! night scenes are always the best. Surreal. Like it very much. I've been in London twice and I just love it! I've marked your blog, as I sure want to explore it all. Congrats on your great work! Well, it's a great photo for sure, but I'm just a dumb American bloke: What's the London Eye? Very, very cool! Great photo. Congrats on being Blog of Note! :) I am now following you. congrats on being a blog of note. I really liked your pictures and the text you added. Nice picture :) I was just there in the Fall (from Canada), and there are so many neat sights in London. Beautiful Picture. That wasn't there when I was in England. I'll have to go back sometime to see it. I never been to London and i wish i can go there one day. I like your blog, especially the picture. You have a nice blog. Your photos make me want to know London desperately! hi. congratulations on the blog of note. i like this picture so much. very beautiful. i'll tell my sister about your blog, she's been in london for two weeks last year and desperately hoping to come back. Love your blog. I'm so glad it was chosen for a Blogs of Note. I'll be visting again. Thanks for taking us to London! Nice perspective on my favorite city. Will be back for more. Congrats on your selection for Blogs of Note! I love you blog. The pictures are great and make me want to go back. I was there a year and half ago and just had a blast. I was there two other times also. Great picture of the eye. It looks even neater at night then in the day! Congratulations on being selected as a Blog of Note. As a geography teacher, I really love how you show us so much of London through your art. You’ve given me a perspective of the people and places I would never have imagined. Thanks for sharing and I look forward to more of your posts. I love London and your pictures make me so nostalgic and really make me want to return. Oh well, I can live vicariously. I've always wanted visit London.But it just costs too much. I think I may imagine myself there through your blog.Thanks for sharing. Hi Nice photographs and congrats on being blog of the note!!! I am excited to find this blog! I spent a summer in London two years ago and I miss it so much!! But thanks to you I can view photos of this wonderful town! What exposure did you use for that?? I love London. I didn't chance to ride the London Eye though. I would have been scared out of my mind anyways. It looks like it's going really fast! Gorgeous pics--all of them! I really liked your post on "Watching the snow melt." So true. Congrats on being chosen the blog of note. what an eye , magic ! I must say that it is quite nice. Excellent photographs in the blog. I picked it up through the blogs of note and have added it to my Google Reader list of photoblogs. I especially like the snow photographs. "London, London", music by Caetano Veloso...congratulations of the my country, Brasil, and me. Nice images. Congrats on being Blog of Note. I love looking at your pictures. They are really thoughtful and as I 've never been to London before I really enjoyed them! What a nice and different "glimpse"! Great shot, it makes it look like a ride. I found it all too clinical. The meticulous inspection for bombs and well...just the pace of the whole thing. Not to put down the view, a great view. A boring ride. Well done on spicing it up. This is amazing!! I am so glad to found your blog! Keep up the great posts…..
Hello! I'm a French girl, i lived in London one year ago, and i just want to tell you that you wrote a beautifull blog, i really love it, it reminds me great things. wow. gorgeous capture and the color is brilliant. I have been in the london Eye but not at night. I rode it in the daytime and felt the full impact of the greenhouse effect. that's pretty sick i got to say! Hi Mo, got your blog from the Blogs of Note. I have now set your blog to my RSS feed. For a couple years now I have been infatuated with going to London, and the whole UK for that matter. It is on my list of destinations that I need to go to. So when your blog came up about living in London, it was an immediate subscription. Beautiful picture. :-) Has never been in London. Hey Mo join me in the blog of note club. You always been a blog of note for me. Terrific surreal image of the eye. I like how the building comes through the moving ferris wheel...beautiful photograph. Nice photo of the Eye. Do they change the colour from time to time? Lovely colour:) What's your secret to have so many comments? Wow! What a picture. A beautiful sight!